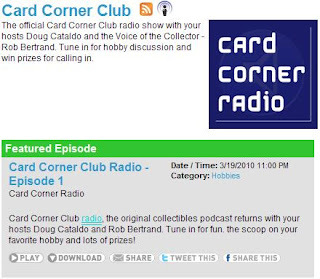 Many of you know I got my start at this sports trading card content producing thing through Card Corner Club in 2003 and one of the things I most enjoyed was doing radio, be it at live events like the National or podcasts. The advent of Web 2.0 has created new opportunities in this medium and I very proud to be co-hosting a regular show on Fridays at 11pm CST on Blog Talk Radio. We had our trial run tonight to get used to the navigation, switchboard, etc. It was great talking to former public relations frontman at Upper Deck Justin, Ryan from Sports Card News and Marie from A Cardboard Problem. My co-host and co-founder of Card Corner, Doug Cataldo L-O-V-E-S giving stuff away so for those of you who need an incentive, FREE schwag is available. The show will run for an hour and then be available on demand. The first episode is available here. It was a good show last nite...and as a note I was the first caller to get through! :) Can't wait to hear more.